A meeting designed to introduce the possibility of Logan County farmers raising industrial hemp will be held Thursday, Feb. 25 at the Logan County Extension Office, starting at 5 p.m.
Atalo Holdings is a Kentucky industrial hemp company interested in investing in Logan County producers. 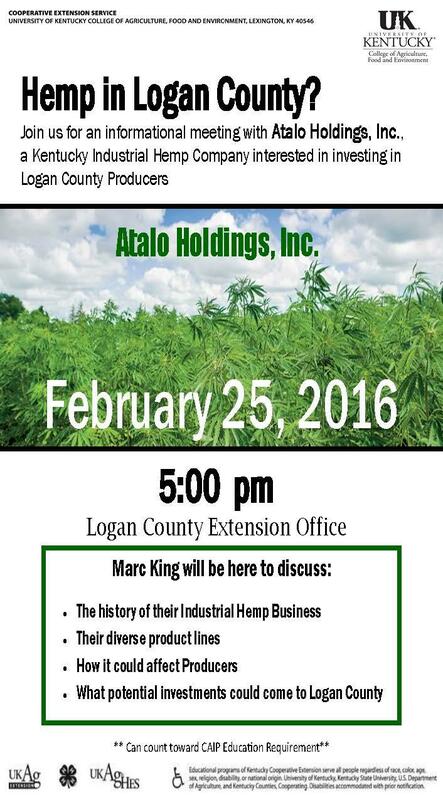 Marc King of Atalo Holdings, Inc. will discuss the history of their industrial hemp business, their diverse products lines, how it could affect producers and what potential investments could come to Logan County. Logan County Agriculture and Natural Resources agent Leann Martin says the meeting is open to people wanting to learn more. On its Facebook page, Atalo Holdings says: “Welcome to Atalo Holdings, Inc.. Providing leadership in research, development and commercialization of industrial hemp.